This was taken exactly 1 week ago. Last week after going out for dinner to celebrate friend's birthday, we went over to Kampung Glam (sounds glam eh, the name? haha) to a cafe where we could have some drinks and chat. 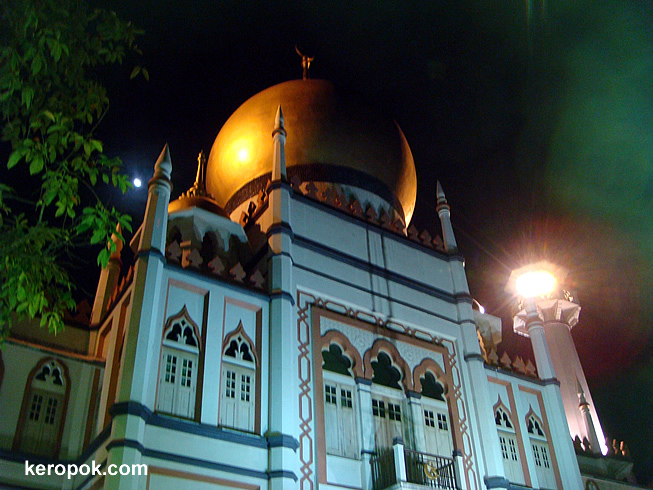 This mosque is in the area, and it is one of the landmark in this area. Even at night, it looks so beautiful. You can visit this mosque if you visit Singapore. Just click here to read more about it at the Tourism Website or if you prefer, the wikipedia version. The building is beautiful, I love the dome and colors. looks like it came out of a fairy tale for some reason, maybe because of the lighting. hope you're having great sunday Keropok. My wife and daughter are in Singapore as I type this comment. They are there at a creativity conference. Thanks for sharing a couple of photos for my wife's presentation at the conference. The collaborative effort added 38 photos, from around the world, to their presentation ... I just got off the phone with them. One comment they made, which you might enjoy, is how good the food is.